Joining a wave of protests across the country, local demonstrators spoke out in response to President Donald Trump’s travel ban that blocks citizens of seven majority Muslim nations from entering into the U.S. These were the scenes at Dulles International Airport and outside the White House on Sunday. 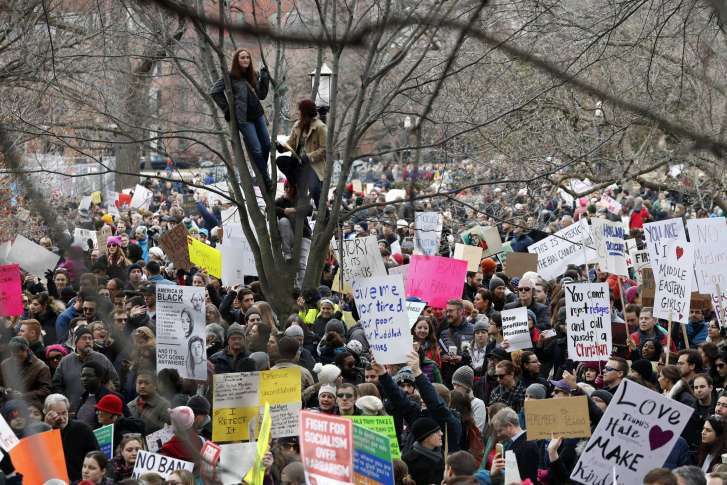 WASHINGTON — In front of the White House, hundreds of people filled Lafayette Square on Sunday, to protest President Donald Trump’s ban on travelers from seven predominantly Muslim nations. Carrying signs, cheering and reciting a variety of chants — from “This is what democracy looks like,” and “No hate, no fear, refugees are welcome here,” to“We will not go away, welcome to your ninth day” — the diverse crowd chanted and cheered in support of Muslims and other refugees. Vocal and expressive, the crowd was alternately solemn and warm in expressing peaceful solidarity with refugees affected by Trump’s order. “I think my faith compels me to be here and speak out for those who can’t speak out for themselves at the moment,” said Thomas Smith, who is a member of the Episcopal Church. President Trump’s executive order blocks refugees from entering the United States for 120 days, and temporarily bans citizens from seven majority-Muslim countries from entry. Maryam Kanna is a 24-year-old Iraqi-American who lives in Arlington, Virginia. She calls the executive order “totally alienating.” Kanna says she worries about her uncle, a British citizen, and her cousins in Canada, who may no longer be able to enter the U.S.
Other demonstrators outside the White House were willing to speak with WTOP, but did not want to give their full names. A woman who identified herself as Sonia from Sterling, Virginia., said she doesn’t recognize what she sees in the United States right now. Nathan attended the march to support his parents, who were refugees from Vietnam. 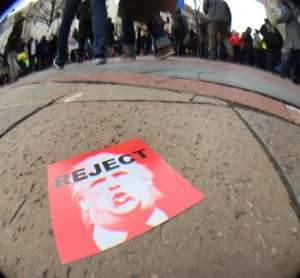 Protesters even gathered outside Trump International Hotel in Washington, D.C. Protests were also reported in St. Louis, Minneapolis; Cleveland; Columbus, Ohio; and Portland, Maine. Omar Al Tammeemi was among more than 100 protesters gathered at the international arrivals terminal at Dulles International Airport. It was the second day of protests at Dulles and at airports across the country. Al Tammeemi said he was worried he may not be able to see his wife and young son who are in Iraq following Trump’s immigration order. He said he worked as a translator for the U.S. military in Iraq from 2008 to 2013 and came to the U.S. afterward on a special refugee visa. He says his wife, who holds a green card, and their young son, a U.S. citizen, are in Iraq visiting her sick mother. Four Democratic members of Congress who attended the demonstration said they were turned away by Customs and Border Patrol officers at the scene when they sought a meeting about whether people were being held unlawfully. Social media reports said crowds were spilling out of the international terminal. WTOP’s Kate Ryan and The Associated Press contributed to this report.